In my first blog post about Noak I wrote that it "makes me want to love it and pull my hair out in almost equal measure." The food we've tried has always been pretty good, it was just the service that was letting the place down. We visited again a couple weeks ago and we were greeted when we arrived, shown to a table, given menus, our order was taken and then the food arrived after a perfectly acceptable wait. They had a generous number of staff working and an order of service seems to have been established, making a big difference to our enjoyment of the café. I know it sounds basic, but previously it wasn't always the case. I had the 'Quite Healthy'. 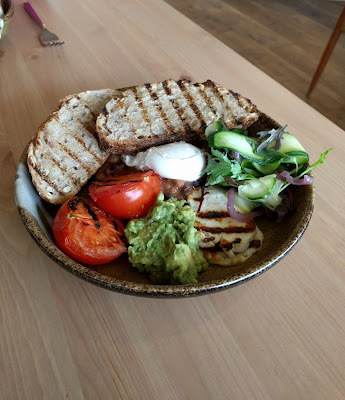 A bowl of halloumi, avocado, home made beans, roasted tomatoes, sourdough, courgette ribbons and an egg cooked to your liking (£10.50). All of the components were well done and the two thick slices of sourdough were a welcome filling addition. Noak felt like it was on the way to being the café we all hoped it would be when they first opened, so it was a shame that is wasn't full on a Saturday lunchtime. If, like us, others have previously been put off, hopefully they too will give Noak another try.